In our home, we have a specially adapted room next to our farmhouse kitchen for your dog to have it's own space at night time. You may bring your dogs own bed with you or we have some of our own which it is welcome to use. Will my dog get walked every day? What will a typical day be like for my dog during their stay at Canine Country Holidays? During the day your dog will be alongside us most of the time in whatever we are doing at home or outside enjoying the country lifestyle. Your dog would be supervised at all times when mixing with our other dogs. If we are out in the garden your dog can be enjoying relaxing, having a mooch about or playing a game with a toy. When out in the paddocks your dog can enjoy a run and walk as long as they ae good with livestock. 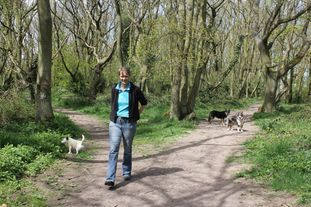 For the dogs which aren't as safe with other animals they will be walked separately on a nice walk on the lead round some of the lovely nearby country walks. After a busy day outside, in the evenings we usually relax in the lounge where all the dogs are welcome to join us in front of the cozy fire. How long would my dog be left alone for during the daytime? I work part time 2 days a week so the longest a dog would ever be left for is 5 hours on one of those 2 days although we try our hardest to coincide those days with days when another family member can be at home. On all of the other days I rarely leave the house for more than an hour at a time. If we are out of unable to supervise your dog for a short time if we are out or busy then your dog can have a room in the house which also has access to an outside area. For dogs who don't like to be left alone then I have the option of taking the dog to work with me at Best Friends Dog Grooming Salon where they can stay in the salon with me. My dog isn't very reliable at coming back off the lead &/ my dog isn't good with livestock, would they be safe in your paddocks? We only let dogs off lead in our paddocks that we can trust to come back and that we know will be safe around our other animals. However we are happy to lead walk your dog either round the paddocks or take them for a walk on one of the lovely local footpaths. 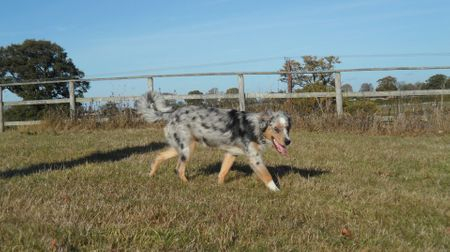 We also have access to a fully enclosed dog proof 4 acre paddock that we can use. 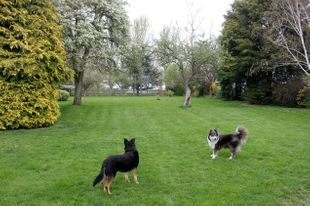 We have a very large garden area (photo to the left) which is completely fenced in & secure for your dog to enjoy. What happens if my dog doesn't get on well with your dogs? We have got the option of keeping your dog separate however our dogs generally get on very well with most dogs. We ask all potential customers to visit for a meet & greet which can help us assess how your dog is in our environment and we can discuss your dogs individual needs. We cannot accept dogs which are known to be aggressive. If my dog is on medication can you give it to my dog whilst it's staying with you? What happens if my dog is injured or poorly whilst I'm away? In the event of illness during the stay, our own vet (Pearl Veterinary group) will be used with charges made to the customer. My dog barks, will this be a problem? We understand that all dogs can bark occassionally to alert their owners or when excited. This isn't a problem but we do need to be considerate of our neighbours so unfortunately we are unable to accept dogs that bark continuously for long periods of time or dogs that constantly bark when left alone. Of course. We encourage all potential customers to visit us and to bring their dogs along to say hello. We completely understand what it's like to leave a dog somewhere new and we hope you would be reassured when you visit us that your dog will enjoy it's holiday here. Visiting also gives you the opportunity to ask any questions and to tell us a bit about your dog so that we can make their stay as stress free for them as possible. It also enables your dog to meet us and our family dogs so that everything will seem more familiar to them when they come to stay with us.